You'll be £11.99 closer to your next £10.00 credit when you purchase Margaret Tudor. What's this? Left widowed at the age of just twenty three after her husband was killed by her brother’s army at the battle of Flodden, Margaret was made Regent for her young son and was temporarily the most powerful woman in Scotland - until she fell in love with the wrong man, lost everything and was forced to flee the country. In a life that foreshadowed that of her tragic, fascinating granddaughter Mary Queen of Scots, Margaret hurtled from one disaster to the next and ended her life abandoned by virtually everyone: a victim both of her own poor life choices and of the simmering hostility between her son, James V and her brother, Henry VIII. Margaret Tudor: The Life of Henry VIII’s Sister is a brilliantly researched novel which transports the reader back to the 15th century. A well researched, informative read. I learnt a lot. Although I am now glad I'm not a princess, well one from the Tudor era anyway! This book is exceptionally well written and the writing style was excellent. In this new book by Melanie Clegg, Margaret finally gets her due. Clegg's writing is refreshing, intelligent, and informative, all without making the book feel too much like a textbook forced upon a group of students. This superbly crafted, meticulously researched, and inherently fascinating biography of Margaret Tudor by author and historian Melanie Clegg is especially and unreservedly recommended for community and academic library biography collections. What a beautifully detailed history. I really enjoyed reading this book. This book provided a lot of detail regarding a Tudor princess and what was expected of her in her lifetime. SO exciting can be history! In addition to the usual suspects, a chapter of the English royal family is opened here, which is not so well known. In addition to many facts, there is a great part of the picture. I would definitely recommend reading this if you're interested in the Tudors or her story! As usual, Pen & Sword don't disappoint. This is the second book on Margaret Tudor I've read recently. I found it well-researched and easy to read. The author's sympathy toward Margaret makes for an engaging read. I agree that she needed female friends! I give Margaret Tudor five out of five stars! This is an accessibly and engaging biography of a woman who had been a somewhat shadowy figure to me, despite reading extensively about Tudor history. The author paints and nuanced portrait of Margaret Tudor, and goes to great lengths to illustrate how she fits into the wider British and European politics of the era. Will definitely look for this author's future work. Approached this title with a little bit of trepidation, since for a number of reasons, I generally loathe the Tudors. However, having learnt a bit about Margaret in a Mary of Guise biography, I wanted more information on this very interesting and completely overlooked individual. Can't say I was disappointed. Really enjoyed this title. Clegg does a great job of staying on point and telling Margaret's story and painting a chaotic picture of the geopolitics at the time in a balanced as well as concise manner. Very clear parallels between Margaret and her granddaughter. I really enjoyed the book because it read more like a novel but you could tell the extensive research the author has done to tell Margaret's story. Very reader friendly! I think this would be an excellent read for teen and YA readers who want to discover the lesser-known known women of history and their place in the world. Melanie Clegg has done an excellent job of gathering information and letting her readers see how different the lives of the royal women were. This biography was well researched and contained a lot of information that I hadn’t previously read in other books. The author’s attention to detail is evident in the writing. Highly recommend! By focussing on these aspects of her personality, Melanie Clegg has managed to paint a vivid picture of a very real woman. I really enjoyed reading about her eventful life, although she seems to have been as successful in her married life as her granddaughter, Mary Queen of Scots (i.e. not very). I would recommend this to anyone who loves historical biographies. This novel was amazing. I recommend it to any Tudor interested reader. We are already used to reading about her bother Henry, but his sister has a very interesting story as well. I found it to be very well researched. If you are interested in the Tudor period, even if you know a great deal about it, this is a most useful and informative book. Margaret had an interesting, if ultimately tragic, life, and this book is worth reading. This was a good book, with lots of well-researched information. My takeaway is that I'm thankful not to be a woman living then! This was a really interesting read about a woman I knew little about and I would definitely recommend it to fans of the period. I've read so many books now on Henry VIII and the family that came before him that to read something about his sister was a welcome change. A fascinating study into a lesser known but important Tudor. You can see the level of research that has gone into this as there is so much information. I really enjoyed this slice of history. This is well written, and direct to the point. A lot of historians of this period tend to pad their biographies of royal women, ie "they might have done X," "she may have experienced Y," but Clegg does not fall into this trap. There is a feeling of being slightly rushed in the last years of her life, but overall, this goes into the perfect amount of detail. You feel like you have really gotten to know Margaret Tudor and her incredibly fascinating life. I found that this was very well-researched without being boring or feeling like a textbook. I particularly enjoyed the bits of compassion and empathy shown toward Margaret where we have little information recorded from history. I also found the fact that the linear timeline style to be easy to follow. Overall, I would call this a light comprehensive biography of this monarch. There were a lot of very interesting details in the books that I, a history buff, was not aware of. The author did a great job bringing an air of authenticity to the story and her descriptions of people, places and events were fantastic. This book is excellently written and makes complex issues clear. For those who are interested in the Tudors it presents a different view of the dynasty and its time. Interesting to read about a not often talked about member of the Tudor clan. I love the Tudor's, which is kind of a weird thing to say when you think about all the violence and cruelty attached to their years on the English throne, but maybe that's why I find them so fascinating. This book was a wonderful biography, quick and easy to read, but also filled to the brink with all sorts of interesting details. I learnt a lot about the early days of the Tudors, how they came to power, and of course especially about Margaret. This is a highly readable account of the life of the Tudor Princess who became Queen of Scotland, Margaret Tudor. Often overlooked in favour of her famous brother Henry VIII, Clegg brings Margaret vividly to life as we follow her from pampered princess, through her successful reign as Scotland’s Queen consort and then her struggles as Queen Dowager. I thoroughly enjoyed every moment spent reading this fascinating book. Clegg's writing was engaging throughout, making me reluctant to put the book down. The history was as informative as it was richly detailed, and I learnt a great deal about the woman I once so easily forgot. This biography is a must-read for Tudor enthusiasts! If I could give this book 6 Stars – I most certainly would. From the first sentence to the last sentence Margaret Tudor: The Life of Henry VIII’s Sister – completely captured both my attention and imagination. I really enjoyed Melanie's book. She is clear, precise and factual without it becoming boring. The situation in Scotland was quite confusing at that time and luckily there is no confusion in the book. I would highly recommend this book if you're interested in the Tudor era. An absolutely fascinating biography of Henry VIII's eldest sister. Little is known about her but the author manages to flesh out her character and history. I'd recommend this to any fan of Tudor History. One of the best historical books I have read in a while. I absolutely love this book. I've always been interested in the lives of the Tudors and this brought insight into Henry's sister Margaret who is often overlooked or forgotten in the shadows of her brother and her niece Elizabeth. I really enjoyed reading this book and learning more about Margaret. An excellent bio of Margaret Tudor, the elder sister of Henry VIII. It isn't often that we see books about her, which is a shame because she is a fascinating woman in her own right, and had nearly as tumultuous a time with love and marriage as her infamous brother. Well written, well researched, and a fun read, which isn't something I say about a lot of biographies, many of which are deadly dull. Not this one. It was an excellent read. Being interested to learn more about Margaret, I requested this title even though Ms Clegg is an author unknown to me. She did a marvellous job, both regarding the research and her excellent writing style. Margaret Tudor is portrayed as a lady who was intelligent and brave although her life was not all a bed of roses, especially after James IV's death. Politics and her private life were complicated, sometimes due to her errors of judgement, sometimes due to political niceties, yet she remained in character the true queen. I would recommend this book to anyone interested in the Tudor period. I really enjoyed this book. This was my first book by Melanie Clegg, and I doubt it will be my last! Overall, I did really enjoy this book and feel like I have learnt a lot about Margaret Tudor, and I highly recommend this book to Tudor/history enthusiasts. Melanie Clegg has done a brilliant job, Margaret made odd choices, had challenges and sadness’s, reading this gives real insight of her life. A most read for Tudor fans. A fantastic historical piece that I highly recommend to all Tudor fans. This is a sympathetic and easy to read biography of a rather unfairly obscure but important woman in a formative time in early modern Europe. I would recommend this book to anyone who wants to attain a deeper understanding of Tudor history. A thorough biography of Henry VIII's eldest sister. Well researched and very informative, a must for any Tudor fan. I thought this book was well written and informative, the author goes into great detail about Margaret's life in an accessible way which managed to keep me interested in the book. I felt the author was sympathetic towards Margeret's life and this shows in the way that the author describes the hardships in Margaret's life and how she comes out as a strong individual. As this is the first source I've read about, this will be something I will keep in mind when I get the chance to read other historians' works on Margaret Tudor to compare whether they believe the same about her character. I believe that anyone interested in the Tudors will enjoy this book. This is a sympathetic and engaging biography of King Henry VIII's sister, who certainly led a tragic life. Margaret faced it courageously and her great inner strength enabled her to fight on through her terrible travails. It's good that she had a little bit of peace before she died with her son and daughter-in-law and her grandchildren. This is a must-read for anyone interested in the Tudors. A very exciting and highly readable account of the life of a lesser-known tudor. This book plays out across what, for a lot of readers, will be a familiar backdrop. The less familiar subject breathes new life into these events, exploring things from a different and intriguing angle. 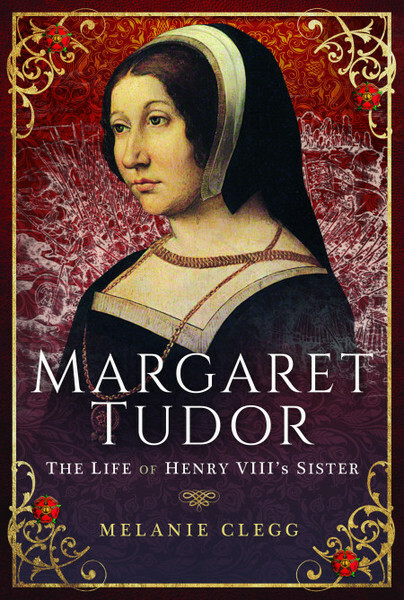 Margaret Tudor is a fascinating figure and this book will be a welcome addition to the shelves of any Tudor enthusiast. This is a well written, well researched and easy to read book. I liked the detailed account of the book. It was super easy to follow. Even if you know nothing about the Scottish court, I think you will be okay. Melanie does a great job of making sure that her readers are still with her. She doesn’t talk down to you, like some historical will, nor does she venture away from the facts. Melanie Clegg has put together an excellent book about this undervalued but still interesting woman who did her best to cope in a turbulent world of continental wars and dynastic game playing. Unlike some historical bios this book flows nicely and is easy to read, you don’t feel like you are drowning under a pile of dusty dates and weighty names. Her style is understated and engaging, I would gladly read her work again. It was written in an easy to read manner and I found it interesting and informative, not just when it comes to Margaret but the whole family. Very enjoyable, and I shall look out for more of the authors work. I was very eager to read this book on Margaret Tudor since she is often passed over due to the shadow cast by her brother. The book was pleasantly written, easy to follow and didn’t bog you down with too many frivolous facts. It truly made me appreciate what Margaret had to endure in her life and the strength it took for her to carry on despite everything she faced. There was one time that the author refers to Jane Austen and it stuck with me because it seemed so out of place. All in all this book was quite enjoyable. I have read a couple of biographies of Margaret Tudor, elder sister of Henry VIII and doubly ancestress of the Stuart dynasty of English kings (through both Mary Queen of Scots and her husband Lord Darnley), in the past and have tended to be very frustrated and confused by them, probably at least partly due to a lack of familiarity with the structure and political machinations of the Scottish court. It was a pleasure to read this latest book, which finally provided me with an engaging and easy-to-follow account of her life. I am a lover of all things Tudor. Be it the Henrys', the Elizabeths', the various wives or the illegitimate children, I am ALL over it. And while I am familiar with the life of Margaret Tudor, I have not found many books that tell her story. So I was thrilled to find Margaret Tudor by Melanie Clegg, and couldn't wait to dive in to her work. And I was most definitely not disappointed. Melanie Clegg does a brilliant job of telling Margaret's story in a readable and wonderfully inspiring way. I was fascinated from the beginning, and learned so much. I not only feel as though I know Margaret a bit more, but I also want to hug the author breathless. A wonderful work! Fascinated by history from a very early age, Melanie Clegg graduated from the University of Nottingham with a degree in History of Art. She originally turned to writing historical fiction and her women’s history blog, Madame Guillotine, as a means of escaping from the dull admin jobs that she found herself doing, before becoming a full time writer and historian.